That leaves out the ability to style TextViews using eg. the Roboto-Medium or Roboto-Black fonts. But why would Google add system wide fonts that can not be used for styling of your TextViews? Surely there must be some way of specifying all of the Roboto fonts from within styles.xml (ie. NOT having to embed the fonts as Assets and creating custom TextViews in code) - but how? On Android 5.0 you can set Roboto Medium with sans-serif-medium. Support Library 26 introduced using fonts in XML, and it's backwards compatible to Android API 14. Right-click the res folder and go to New > Android resource directory. The New Resource Directory window appears. In the Resource type list, select font, and then click OK. 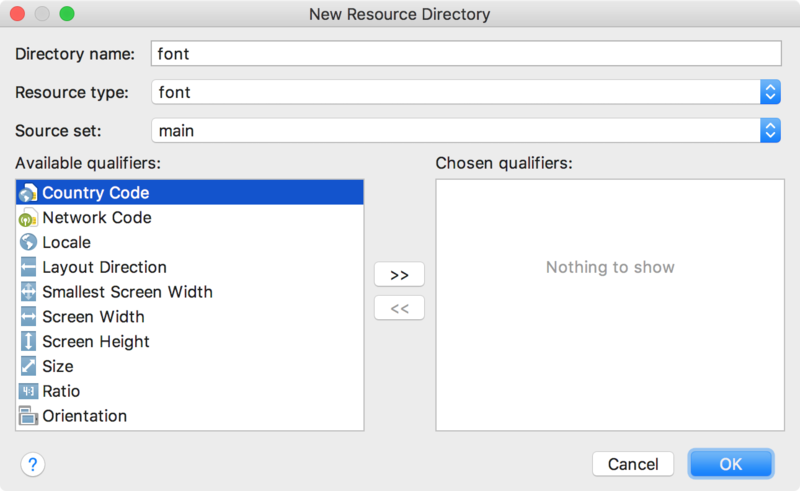 Note: The name of the resource directory must be font. 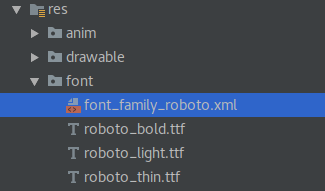 Add your font files in the font folder. The folder structure below generates R.font.dancing_script, R.font.lobster, and R.font.typo_graphica. To set a font for the TextView, in the layout XML file, set the fontFamily attribute to the font file you want to access. The Android Studio layout preview allows you to preview the font set in the TextView. To add a font to a style, Open the styles.xml, and set the fontFamily attribute to the font file you want to access. Not the answer you're looking for? Browse other questions tagged android android-fonts android-typeface or ask your own question. What is the difference between fontFamily and typeFace in android?